Bacteriophages are natural antibacterials that have many potential uses in the cosmetics field. However, formulation and stability of products is an issue that has not been widely addressed. The Fixed Phage technology allows phages to be stabilised by irreversibly immobilising (covalently attaching) them to common excipients increasing both shelf-life and efficacy in standard formulations. Acne is a skin condition typified by the proliferation of facial spots and scarring. While it is commonly associated with adolescents, it often carries on into adulthood, and has been identified as one of the ten most widespread diseases [1, 2] worldwide. The global market for acne treatment was valued at $4.9bn in 2016 and is predicted to rise to $7.3bn by the year 2025 . The most common forms of medication used to treat acne include creams comprising benzoyl peroxide and salicylic acid, as well as various formulations of antibiotics, for direct application on the skin or oral administration. These act to reduce levels of acne by either directly killing P. acne (the bacterium that causes acne) or unclogging hair follicles. Despite their effectiveness, benzoyl peroxide and salicylic acid have been found to induce negative side effects in some users . They are also detrimental to the environment when released in large quantities [5, 6]. Additionally, the development of antibiotic resistant strains of bacteria has resulted in a drive to reduce the use of antibiotics in many products. A need has been identified for the development of alternative treatments which are effective but which are not harmful to the user or the environment and which do not increase the spread of antibiotic resistance. The strategy Fixed Phage employed was to use immobilised bacteriophages to treat acne by targeting and eliminating P. acnes. The advantage of using bacteriophages as a treatment option is that they are naturally occurring, harmless to the environment and specific in their mode of action, allowing for the direct targeting of the bacteria in question. Fixed Phage’s patented technology allows for the stabilisation of bacteriophages for long periods of time, meaning that they can be efficiently incorporated into a product. 1. Simple emollient cream (SEC). 2. SEC with 1 x 105 pfu/g “free” bacteriophage. 3. SEC cream with 1 x 105 pfu/g bacteriophages immobilised onto nylon beads. 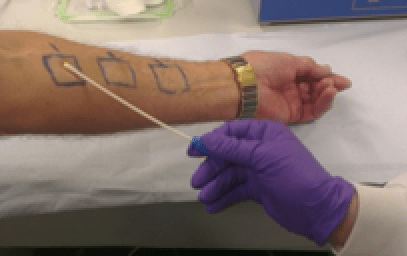 At various time points, swabs were taken to determine the bacterial load remaining on the skin. Within one hour, bacteria were eliminated using the cream containing immobilised bacteriophages. The other treatments (including “free” phage at the same concentration) did not remove all the contaminating bacteria. 1. Bhate, K; Williams, HC (March 2013). “Epidemiology of acne vulgaris”. The British Journal of Dermatology (Review). 168 (3): 474–85. 2. 2010: An Analysis of the Prevalence and Impact of Skin Conditions”. The Journal of Investigative Dermatology. 134 (6): 1527–34.